Remember when you were off sick from school, and because it wasn’t during an official school holiday, the only thing on TV was day time television and S4C? If you were lucky, Channel 4 would be showing some animated films from eastern Europe or somewhere; they smelt vaguely of education but at least they weren’t Pebble Mill . Later in life, you would discover that you’d seen Jan Švankmajer’s Alice and would feel quietly smug. 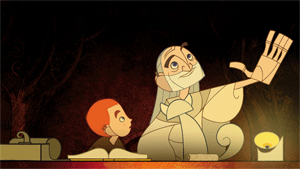 The Secret of Kells is one of those films. On paper it sounds like just the sort of film a Guardian-reading adult would stick in front of their children instead of Monsters vs. Aliens or whatever, just so they had something to crow about the next time the paper ran an article about the best children’s films. 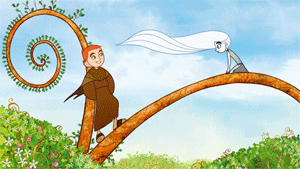 The Secret of Kells is an Irish-French-Belgian co-production inspired by the Book of Kells , an illuminated manuscript created by Celtic monks c800AD that contains the four Gospels of the New Testament . According to Wikipedia, ‘the illustrations and ornamentation of the Book of Kells surpass that of other Insular Gospel books in extravagance and complexity’. SO NOW YOU KNOW. Though this all sounds quite, quite terrible, the film is actually excellent. The story is a fictionalised account of the creation of the manuscript itself in the Abbey of Kells. Abbot Cellach, voiced by Brendan Gleeson, devotes all the resources he can to strengthening the walls of the abbey to fend off a Viking attack. Meanwhile, Master Illuminator Brother Aidan looks after the Abbot’s nephew and indirectly encourages him to venture into the forbidden woods where he meets a woodland spirit named Aisling and is drawn into battle with Crom Cruach, a pagan diety. There are also wolves. Generally speaking, it’s a pretty dark film. The eventual Viking attack is presented more as a World War II invasion than a medieval skirmish. Blood is shed, people die, buildings are burnt. The wolves in the forest are easily up there with the winged monkeys of Oz as ‘things your children will be scared of for years to come’ and Crom Cruach itself is like something out of Tron , a giant eel all glowing, angular lines and teeth. It isn’t all gloom, though. The forbidden woods, seen through the eyes of Aisling, are lush and green and everything is very impressive. Drawn in a highly-stylised fashion that eschews traditional perspective in favour of everything appearing on the same 2D plane, it feels more like watching an animated tapestry instead of a film at times. Characters will move up, down, left and right but rarely into or out of the screen. 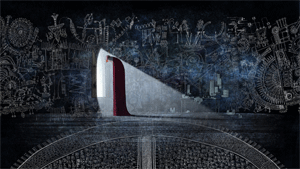 Cues are taken from the illuminated style as well, making the film full of curlicues and ornamated bits and bobs and people with geometric shapes for heads. Altogether Kells has a visual style far more distinctive than a typical Pixar film, but it’s the story and drama as well that makes the whole film so captivating.